Okay! I have erased and re-drawn this page so many times it’s driving me insane. 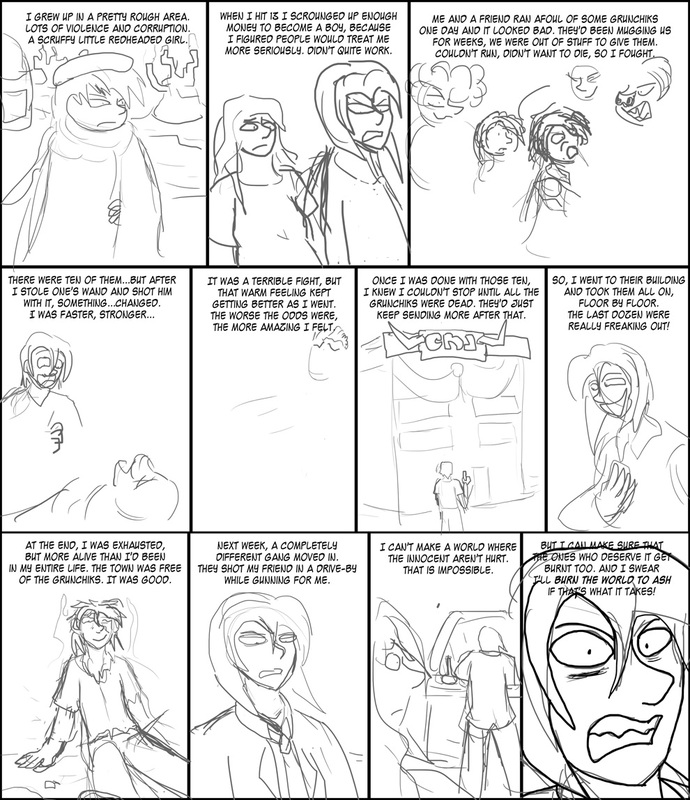 I needed to let you all know I’m still working on it, and I lost patience with myself, so here’s another rough page. Thank you all for sticking with me. I’m gonna go think real hard and try to fix this in the morning; trying a few new ideas. Kinda explains why she’s so blase about making other people stuck as girls. Yay! Finally a new comic! I check almost every day, so I know how long it’s been (besides Merlin’s filler art) I follow your comic because of the interesting plots and story – don’t worry so much about the art. Seriously, the plotlines are so good that you should think about becoming a writer with maybe an occasional illustration in a book. Or make your webcomic a paragraph of writing with only one drawing. For this one either the first or the last seem the strongest tie to the plot. If you are having difficulty drawing a particular panel, maybe that is because you don’t have a clear vision of how you want it to be. So don’t bother drawing it. Just give us the story. While I’m the first to admit Speedball’s writing is a million times better than his artwork, I don’t think his writing style would work without the art. By presenting information visually the plot moves faster and the themes can be explored from multiple directions. A page like this is the perfect example of how much more smoothly an exposition dump can be delivered in comic form as opposed to text. The other big reason this story works better as a comic is that the world and characters look much more interesting than they sound. The atmosphere and everyone’s personalities are better suited to being presented visually rather than through description. Just by seeing people’s facial expressions you can tell what tone of voice they’re using, so each line of dialogue feels more impactful. Is Speed a great artist? I guess not, but he absolutely excels at art direction. No matter how simply drawn something is I know exactly what I’m looking at, where it exists in space, and how it is supposed to make me feel. That’s a very special talent and shows a great deal of care goes into every single panel. The simple lines and colors actually make it easier to focus on the important parts without being distracted by unnecessary details. So would I prefer if, say, Merlin drew this comic? She’s certainly proved more proficient at penciling and coloring, but the chapters she has drawn have been my least favorite by far because they lack the elegant direction Speedball puts into EVERY SINGLE DRAWING. I’ve read my share of gorgeous comics, but Speed’s art manages to communicate more information and emotion than even some of the best drawn comics I’ve ever seen. This is a really nice comment. Thanks. I’m going to finish this one. I just needed to get this out there. Cray sounds like the host of a mono-maniacal spirit, a spirit that actually used to be part of a whole set of spirits dedicated to “fixing imbalance” or something similar, but the group of spirits or over-spirit got sundered, possibly in the last Breaking, and now without it’s counterpart spirits its own mono-maniacal nature, which keeps it safe from corrupting influences or deviating in its sworn duties or breaking the pact it gains power from, is stuck responding with increased escalation. The rough page is great! Just the text content alone is satisfying to my lore-bug! Thanks for the exposition, it helps me understand Cray’s motivations. Ah yes, that road to Hell is well traveled. Good intentions and detours towards “Screw It” Town. Anger is always the easiest drug. Hmm. so she picked the easiest way. is it just me or is she too lazy to do the right thing instead? @ Kaos, it’s not just you, and what about that whole “quested to get the power” bit she told the leader of the Hearts society? She’s creating MORE evil people by her actions and perpetuation of corrupt systems. I’m not surprised she’s insane, but this is the stupid kind of crazy. Although I guess with her abilities her refusal to proof-check her plans isn’t really a problem. ‘Grunchiks’… are we supposed to know what those are? I assume a gang of some sort, but also a species, maybe? It’s just the name of the gang. No wonder the demons love Cary – she’s too stupid to realize all the pain and suffering she causes HELPS them.